Looking at coffee machines I came across this - it's the automatic version of the M100 (it stores how much water to pump through for an espresso/lungo as you like it) AND you get the Aeroccino milk heater/frother for just a tenner more than the machine on its own (or the machine is £55 at Comet if you want that hassle). Given you also qualify for a £40 credit on capsules (direct with nespresso club) and get a 3 year warranty as standard from what I understand, I think it's a pretty good deal. The Aeroccino has good reviews and the items are easy to clean. and It seems to be worth about £50-60 looking on eBay. Were is the 40.00 credit ? cant see it on amazon. 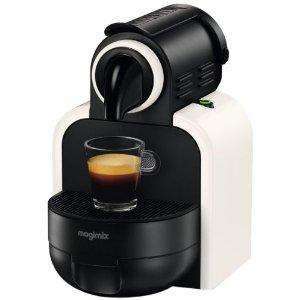 The credit is a nespresso club promotion directly for machines bought until January. Not sure why this went cold - the espresso is hot! Cancelled my Amazon order - Debenhams doing at same price but with TCB as well... shame their TF49 code doesn't work for this. I have reposted as a Debenhams deal which, with TCB and their TF49 code until tomorrow now works and comes in at £84.60!!! If you like paying 5x as much for you coffee from a limited range of coffee beans and giving money to Nestle then I am sure this is one way to do it.